Happy Passover! Judaism is full of holidays and traditions, and for Passover, the tradition of avoiding leavened foods for 7 days (or 8, depending who you ask) is mitigated by the seders held on the first two nights. A seder is a dinner in which the story of Passover is told, you drink four glasses of wine, you search for the afikomen and many other things. “Seder” is Hebrew for order, and the seder has this name simply because everything is done in a particular order. During a seder, you read along in a book called a haggadah. The most famous haggadah was actually created by Maxwell House! But in 2010, after I came home from spending 5 months in Israel, my mom and I put together our own haggadah, which we’ve used ever since. Before this year, the only years that I did not attend a seder hosted by my parents were the four that I spent in college. But since they moved back to New York, this year, I was on my own. I’m happy to say that my husband and I successfully hosted our own seder this year! It was attended by two other couples and a one-year-old, and we had a great time. Traditionally, four questions are asked during the seder. Here’s a fifth question – what do you make for dessert when you can’t use flour? The answer, besides flour-less chocolate cake, is macaroons. Of course, homemade is still preferable to the chewy blobs of coconut that you can get in a can, so this year, it was time to create my own recipe. 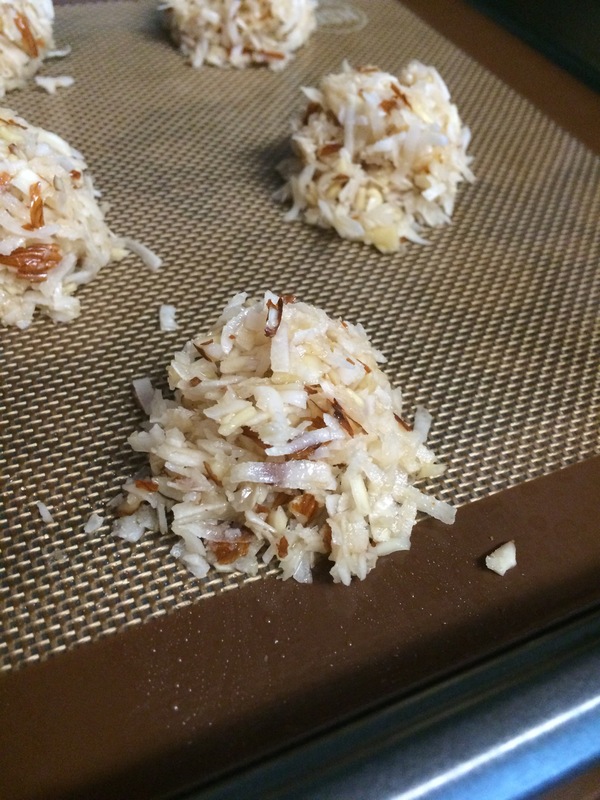 I’m not the biggest fan of coconut, so with some help from Martha Stewart, I decided to make almonds a focal part of my macaroons. 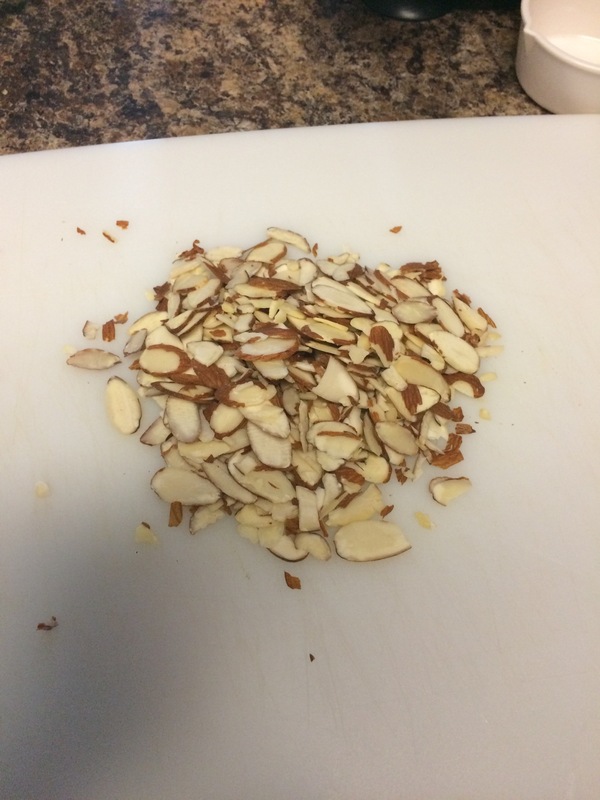 I used sliced almonds, as pictured above, because that made them easy to chop. It’s certainly possible to use whole almonds if that’s what you have! 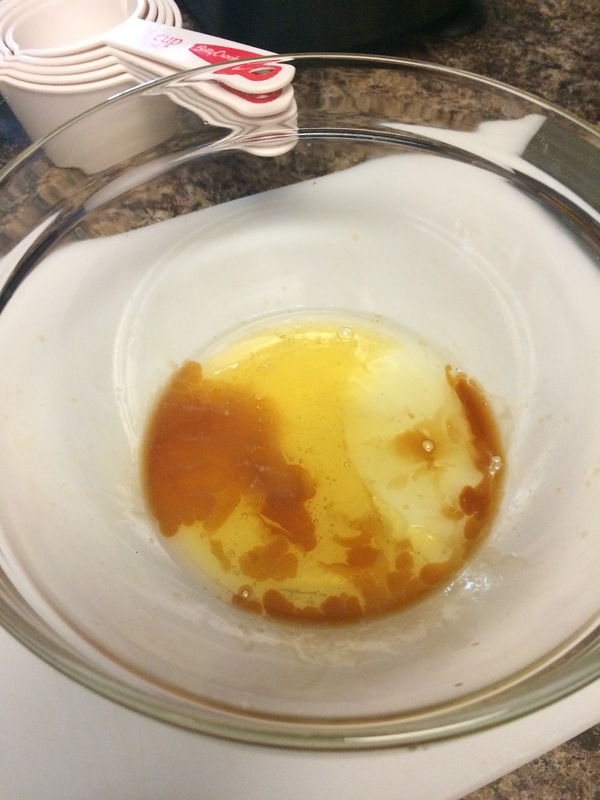 First, you whisk together your wet ingredients – an egg white, some honey, some vanilla. 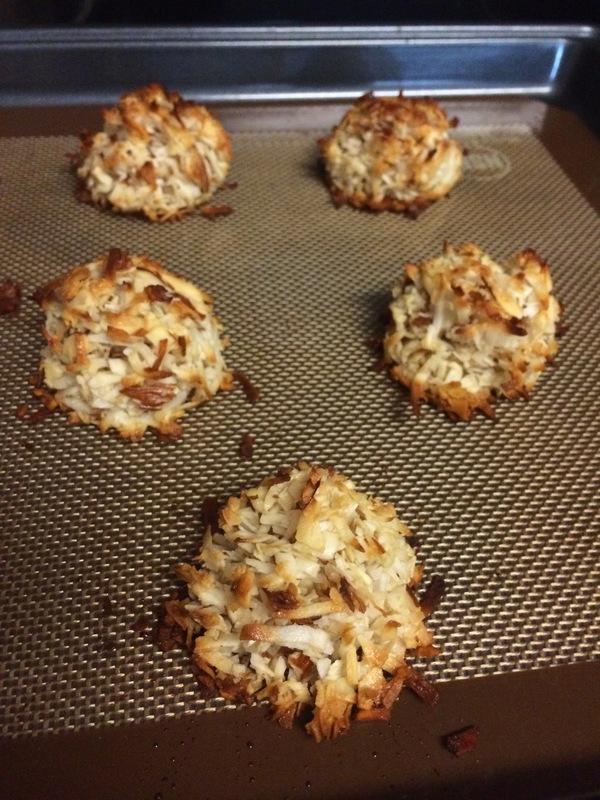 I have always made macaroons with the egg white only, but my husband recently made some macaroons from a recipe he found in one of his biking magazines, and it said that it was possible to use a whole egg. That’s how he did it, and he said they were good, so feel free to do the same! 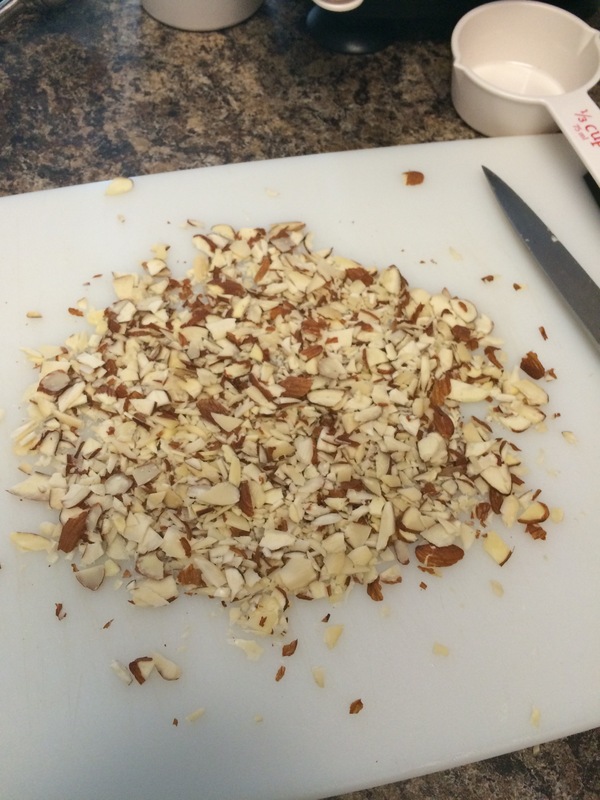 I chopped my nuts, making them into fairly small pieces, although not pulverizing them. 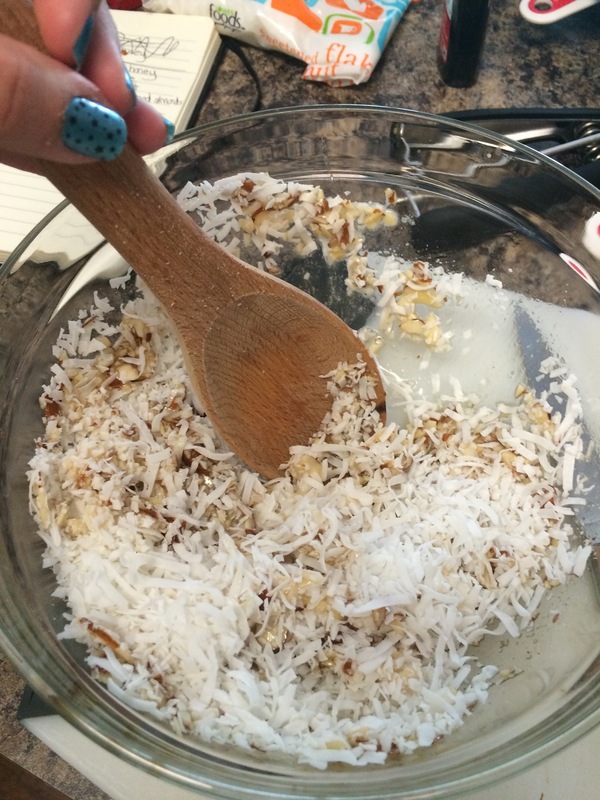 Then you throw the almonds and the coconut into the wet ingredients and mix it up. 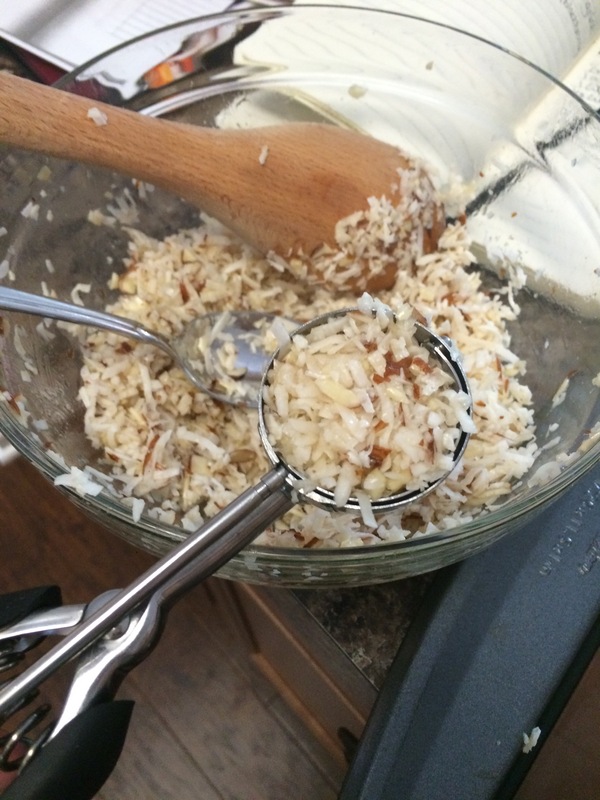 Make sure each piece of coconut and almond are coated in the egg/honey/vanilla mixture! I spooned the mixture into my cookie scoop, making sure to pack it in really well. That makes them come out in these nice little mounds on your cookie sheet! They only need to bake about 10 minutes to get that nice golden color. WARNING: These cookies do not hold together very well. Be careful when lifting them off the cookie sheet, or you might end up with a mess! I wish I had taken pictures of the first seder in my own house! Oh well, next year. What Passover and/or Easter traditions do you have? Whisk together the egg white, honey and vanilla in a bowl. 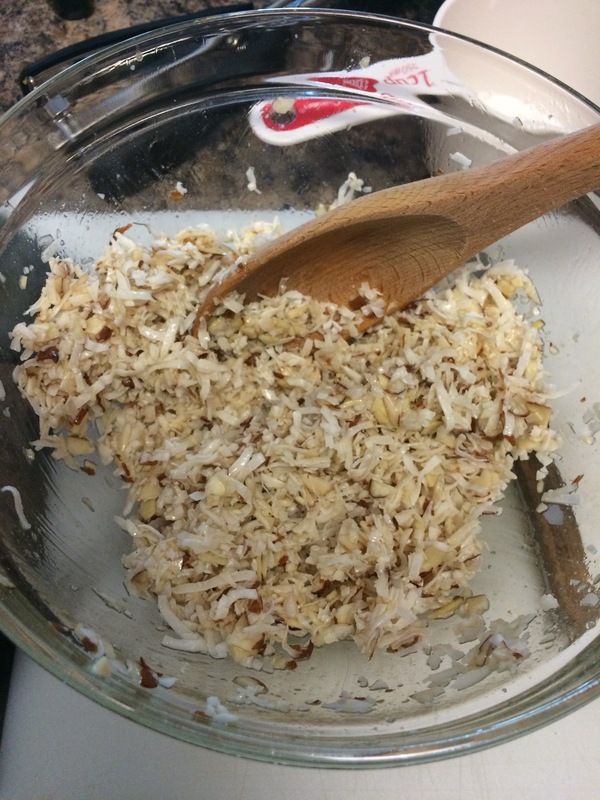 Stir in the almonds and coconut. Using a spoon, pack the mixture into a cookie scoop, and drop onto a cookie sheet covered with a silpat or parchment paper. Bake 10-12 minutes. Makes 8-10 cookies!